NUBACHA!! Don't be fooled as it sounds like one of those Japanese style tea outlets, isn't it? It is definitely not one of them. Nubacha restaurant has been going for 10 months and is one of the historical town's venues of a smart choice for western food. A combination of old furniture right infront of the bar counter, renovation blends in simple modernisation feel with unique table arrangements with white chairs and pieces of funky arts adorning the wall. The menu here offers some inspirational relief from the standard Western fare. With his passion for food, the chef deviates from the norm and comes up with his own recipe. Home made sausage with cheese. Ground pork with cheese- fresh, meaty and flavorful. A star studded dish indeed! Something slightly more humble, but still a good choice. Well marinated with earthy flavour. The accompanying sauce and the perfectly grilled chicken is a good counterpoint. From the grill, the surf and turf with this delicious pork belly with chef's apple sauce means a perfect lunch. Adventorous! Every bite is exciting! Charbroiled pork patty tooped with lettuce, tomato and cucumber. Forget about fastfood! Spend a little more time and you will definitely be pleased. Succulent and juicy pork patty. Even the wheat buns are chef-made. Golden crumbs chicken fillet topped with lettuce,tomato and cucumber. Mr Mark Britt Ruffin from Maryland,USA has been running this cafe since 1997. Back then, dad's shop was just a few doors away and we used to dine at Rock & Rolls quite frequently. And then we moved. Nostalgically, bro brought us back to pay Mr Mark a visit. Nothing much has changed except our age! Everything else is well kept. The vintage and classic concept that blends along with the coziness of the cafe makes here a perfect place to chill. Mr Mark loves playing guitar and he runs a band, you will note that there are lots of posters of legendary artists and rock & roll bands. As good as before. The only "true" American home-cooked food in town. They do serve certain western food that fits the local demand as well. Fillet Steak @ MYR 52.00 served with salad, garlic bread, fresh veggie, baked beans and mashed potato. Tenderly grilled served with rich, creamy delicious sauce. Spagethi Bolognaise @ MYR 22.00- Classic! Chicken Cordon Blue @ MYR 20.00 served with salad, garlic bread, fresh veggie, baked beans and mashed potato. Rich and tasty. Thai Chicken Fillet @ MYR 16.00 served with baked beans and french fries. Sweet, sour and spicy sauce with perfectly grilled chicken. If I ever ask you, where is a good place for authentic western food in Malacca and your answer is Amigo- I am going to knock your head. Come on!! There are few better choices in Malacca! Rock & Roll...rocks!! Psst! Psst! Mr Mark is a proud owner of 200 or more guitars! By the way, there are live band performances avaiable at certain hours. 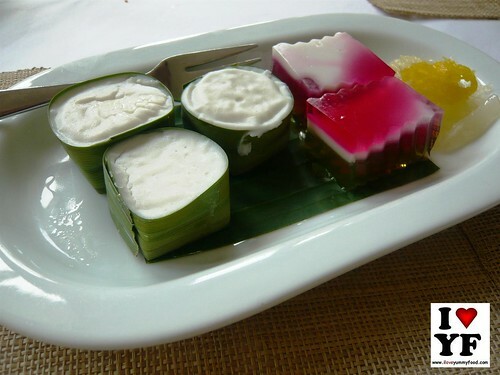 Some food to tease your taste bud today? Let's do Thai! 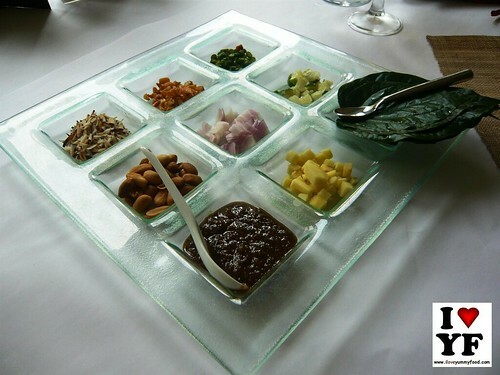 Thai cuisine is one of the tastiest cuisine that should picque the senses of most foodies. But...where to dine? Rama V- I say! 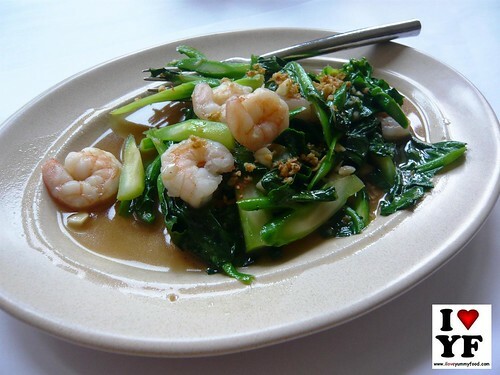 Rama V, is one of the well known Thai restaurants firmly located in the heart of the Kuala Lumpur City since 1995. Despite being located in the city, once inside, diners will be whisked to a serene garden with a pool of lotus blossom, away from the hustle bustle city noise. 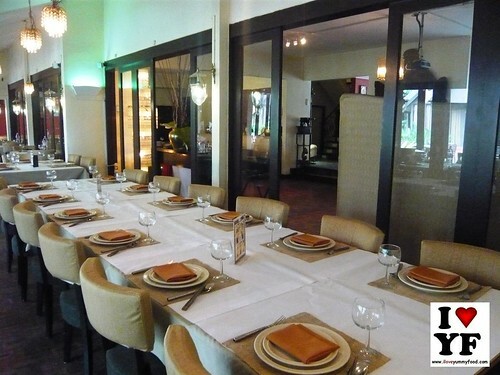 Indoors or outdoors, Rama V provides a relaxed dining atmosphere. The neat and pleasingly table settings creates an ideal environment for wining and dining. Other than these, there are private dining rooms too. Weekend Ala Carte Buffet at only MYR 68.90 ++ with free flow of selected beer, house wines, chilled juices and soft drinks! A traditional Thais street appetizer/ snack that I personally find it interesting. Betel leaves wrapped with-ginger, peanuts, onions, lime, chilli padi, roasted shreded coconut, and dried shrimp and sauce. An interestingly explosive start. 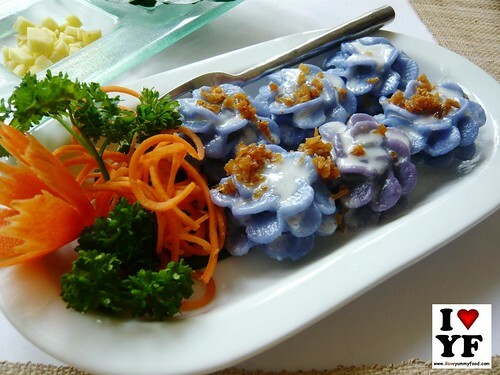 Flower shaped dumlings stuffed with flavourful minced chicken and peanuts. 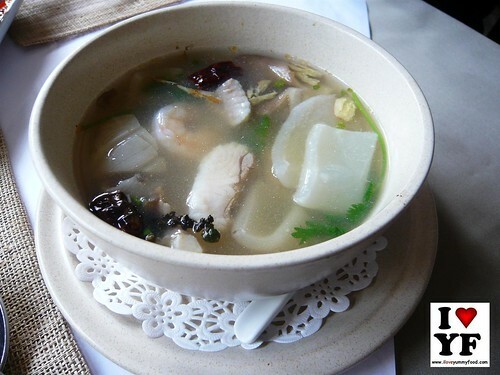 Spicy King fish soup flavored with lemongrass. 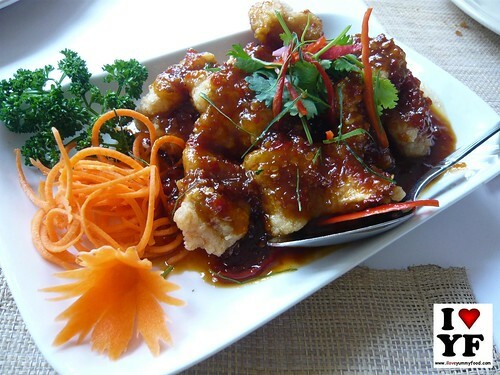 Fried fish wish special chilli sauce. Fresh and tasty! Roasted duck prepared with red curry and lychee. An interesting combination indeed! Pad Kana Kung Krob Reu Kana Pla Kem- Stir fried kai lam with shrimps. 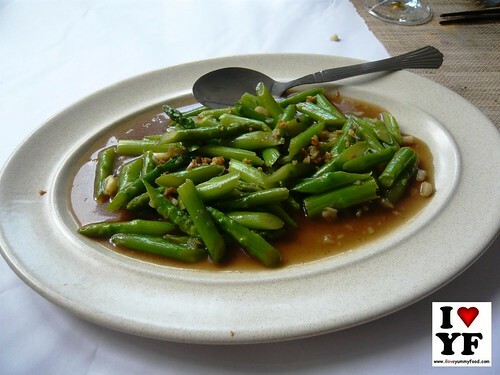 Pai Nor Mai Farang-Stir fried asparagus with garlic. 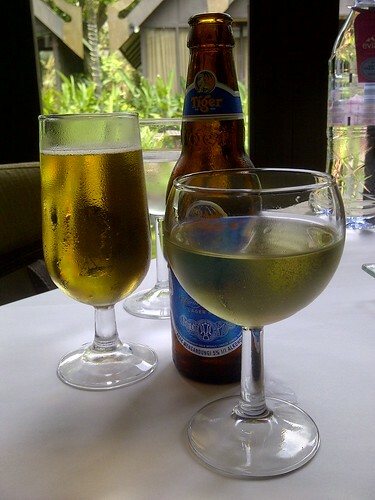 Ending the dining session with assorted Thai dessert and of course some wine and beer. Blissful! 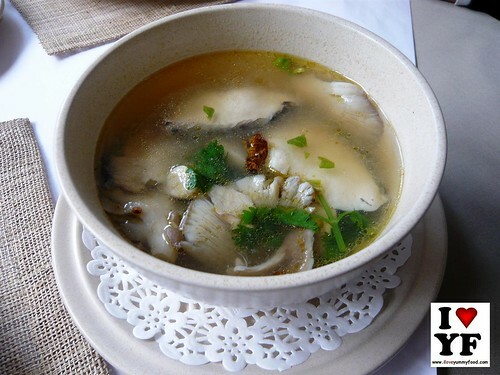 Over the years, the restaurant has been recognised with a number of awards namingly rated as one of the best restaurant by Malaysia Tatler's Magazine as well as being listed as one of the Top Food 40 status by Time Out Kuala Lumpur. 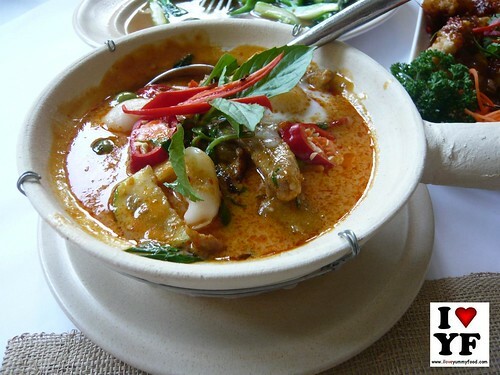 No doubt, it's a restaurant that offers distinctive Thai cuisine and also a spot to eat, drink, relax and enjoy!